Kitchen exhaust hood cleaning in Ventura CA is a relatively simple process, but that doesn’t mean that you should try to handle it yourself. In order to get a truly effective cleaning and fulfill your code obligations, you need to get professional help. 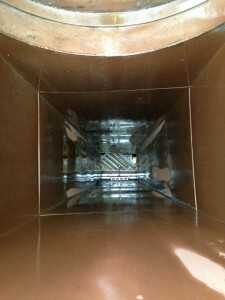 Flue Steam is an excellent contractor to call for all your exhaust hood and exhaust system cleaning needs. We can not only scrape clean your exhaust hood, but also provide grease filter exchange service, steam cleaning, and exhaust fan repairs. During a kitchen exhaust hood cleaning in Ventura CA, a qualified technician from Flue Steam will hand-scrape as much grease as humanly possible off of the interior and exterior of your exhaust hood. The main reason to do this is to prevent grease buildup from getting so hot during cooking that it actually ignites inside your exhaust system. A secondary benefit is that a through scraping will help reduce odors trapped in that sticky, greasy layer. And finally, you will want to get regular kitchen exhaust hood cleanings to ensure that your kitchen does not violate any fire safety codes.